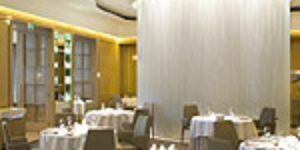 "aqua kyoto is a unique Japanese restaurant showcasing chef Paul Greening’s innovative cuisine. 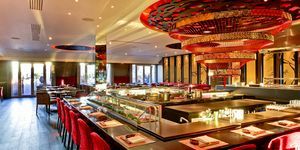 An extensive menu of beautifully-presented sushi and sashimi is complemented by creative hot dishes combining the highest quality British produce with Paul’s contemporary technique. 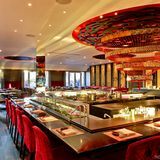 A central sushi bar and open sumibiyaki charcoal grill combine with sleek black and red décor to create a sense of theatre in keeping with aqua kyoto’s location in the heart of the West End, high above the bustle of Regent St."
By sending this booking your details will only be sent to aqua kyoto and will never be shared with other third parties. By clicking this box you agree to the Terms and Conditions set out above. You can book to reserve an area of aqua kyoto for you and your friends. Just enter your requirements below to see what they have to offer. What did you think of aqua kyoto? Recommended by a friend. Nice outside bar area. Cocktail was good but get expensive. £26 for two cocktails - not sure that is 'normal' even for London. Service charge added b default - bit cheeky seeing as the bar lady was as miserable as sin! Don't think I'll bother with this place again. Having tried nueva the Spanish, I knew that kyoto would also be a great experience. We enjoyed the infinity brunch with champagne on Sunday and came back during the week for some delicious platters. Great atmosphere and another good central place for meetups. I've been a few times and its everything you'd expect. Great roof terrace to compensate for over-priced cocktails, impressive interior but when it comes to anything with any substance, ie attentiveness of staff, quality of food / cocktails it really lets itself down. We were unknowingly charged a 12% service charge for being served at the outside bar where we just ordered a bottle of wine. It was practically self service apart from her operating the till and opening the bottle. Not acceptable. The clientèle tends to be Euro-trashy attracted by its reputation of somewhere cool, sharp and competent but in reality Aqua has had its day. People who appreciate friendly staff, good food, good cocktails in a laid back, cool but unpretentious atmosphere don't hang out here. The lunch here is absolutely incredible. Me and my colleagues went on Friday and couldn't decide what to order so the waiter put together our lunch for us. The service was attentive but subtle, food was great and that view is unmatchable in central london.. Strongly recommend the black cod! Will definitely be returning! I am not sure if our poor experience was due to visiting on a Monday night,but everything about this place is ridiculous.From the bored staff( way to many If them It took 3different waiters to walk us to our table-like pass the parcel). To the food-summed up In 2words: overpriced and boringly bland. The worst tasteless excuse of a cheesecake we ever tried.Horrible!And if my partner was not a polite chilled out guy-I would have insisted on not paying. If the chef was ElBuli trained-they would have never existed. Sad place with grand desires that will never be achieved . Not to be recommended- and your money are better spent in any tourist trap and will go a long way. I went with a friend Thursday evening for a cocktail or two. We waited 15minutes to be served and it wasn't even busy. The bartender (obviously new, short with long blonde hair) was incredibly slow and persisted in serving people before us that had not been waiting as long as us. When I pointed this out to her she was very surly and there was no apology. The cocktail, Kyoto Breeze, was not worth the wait. We had our drink on the roof terrace, which doesn't even have a good view, and were surrounded by chavs. I may have to go back and try the food, hopefully we will get drinks delivered to our table a bit quicker! Lucasid - you don't have a clue! The set menu at Aqua cost £110 per head plus drinks. If you work in the restaurant trade, you should know that. We normally go to Hakasan (which is always exceptional) but wanted to try something different. We learned our lesson. P. S. Can I say the 'you should eat' in pubs comment is just plain silly. Alas, attitude comes with places like Aqua Kyoto. It's even worse in NYC. If you don't want "pretentious" staff, you'd be better off at a place like Criterion, Avenue, or Langans. Not trendy London hot spots. I work in the restaurant trade. At a restaurant like Aqua, you really shouldn't go if you can only afford the set menu. For a group of 30 at lunch, you should really go to a pub. Sometimes I need something out of the ordinary when eating out. I can say aqua kyoto fits the bill perfectly. I really appreciate the fact that the tables actually have some space between them. Other good quality restaurants I could mention pack the tables so close together that you are almost on top of each other. The dish that impressed me the most was the twice cooked crispy pork belly with langoustines. The waitress who served the dish was so knowledgeable , I really enjoy being helped through the menu with out being left to feel stupid. I asked the waitress which wine would suit our order, without hesitation she said the Barbera Riva Leone Piedmont, I checked the cost and thought I wasnt being ripped off. The dessert of plum wine and fruit sushi rolls are a very original way of ending the meal, the fruit sauce was great with the rice rolls. On the whole a very pleasurable experience. aqua kyoto has an attitude. Not necessarily a good one either. It's a shame because the food is actually quite nice and our waiter was good but we had to give the name of our booking 4 times. We were then told to take a place at the bar and they would call us when they were ready. This never happened, no apology and we then had to give the name again. Seriously guys if you are going to give a cool competent image, live up to it. Food was gorgeous, but everytime a dish was served, it was the wrong one, or 2 out of the 3 sushis were wrong. Our servers did apologise for this. And then we had the experience of the bar. Possibly the most pretentious bar staff you will come across who made you feel like you were lucky to be served, which we were because service was so slow. This place is simply cool - never seen anything like it! And the food is pretty good too. The sushi was like nothing I've had before- really fresh, full of flavour and delicately presented. Leave room for the Green Tea Tiramisu for dessert. I went there with colleagues on last Tuesday and I have to say, the best Japanese food in town! The unique sushi with far superior to anything I have tasted in some of the other top end restaurants. We had a tataki platter with foie gras sushi which we kept talking about the day after, the black cod and the beef tenderloin were mouthwateringly delicious. I had a cocktail with sake, gin and sherry which came with a piece of cheese and grapes. It looked good but it tested even better and I can say the same about the dishes too. We definitely will be going back! 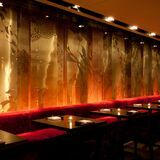 aqua kyoto isn’t cheap, but inspired food and an electric atmosphere make this spectacular experience money well spent. Set a hair’s breadth away from Oxford Circus, aqua kyoto sits atop the former Dickens & Jones department store and overlooks London’s iconic Regent Street. It’s a fabulous venue standing proudly near timber-framed Liberty and opposite the star-studded London Palladium. The entrance on Argyll Street leads onto a mysterious corridor, at the end of which a lift whisks you up to the 5th floor, far away from the shopping crowd. aqua kyoto is a dark labyrinth oozing style and sophistication, and when the lift pings open, you’ll feel as though you’ve stepped onto a stage set for 007. An attractive assistant greets you, before leading the way through cocktail-sipping City-slickers and out into the restaurant. Loud pulsating music makes the place feel more like a funky nightclub than restaurant, while square tables and wide rectangular chairs create a neat, clean and minimal look. 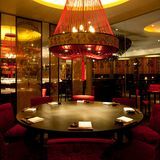 In the centre of the room, chefs dance while they work behind the sunken sushi bar, illuminated from above by glowing red lotus leaves. The far wall is made of glass, enabling dinners to gaze out at the terrific London skyline or step out onto the hip terrace, complete with outdoor bar. Service is slick, efficient and friendly: waiters and waitresses are well informed of the menu and eager to recommend dishes, while the keen, precise sommelier is never far away. Don’t be surprised if the restaurant manager pays you a visit, too. New head chef, Paul Greening, has put his own stamp on the menu here, and he and his team deliver an awe-inspiring culinary experience. 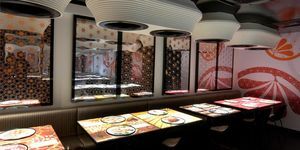 The menu ranges from small plates to salads, dishes cooked on the sumibi yaki (charcoal grill), larger mains, and tempura, sushi and sashimi. Although extensive, this ambitious menu is executed with finesse and every dish is presented as if a work of art. Begin with sea bass sashimi (£12.50), where fine yet meaty slivers of sea bass are arranged like a halo on the plate; or a fresh crab and glossy seaweed salad (£12.50). Adorned with strands of seaweed, rising up from the glass serving-dish, this thing of beauty appears to float on some magical sea bed. A ‘soap bubble’ of tomato dashi lies, like a soft pebble, atop the crab ready to be pierced with a chopstick to release the subtle broth. After teasing your palate with these delectable offerings, continue with prawn and oba leaf tempura (£13.50), where fabulously sized prawns are encased in a sparkling light batter. Perfectly balanced by crunchy tempura, the prawns taste even better rolled in the accompanying green tea salt. 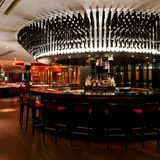 From the grill, which sparks and flares delightfully from across the room, indulge in a dish of black miso cod, tonburi seeds (also known as mountain caviar), and seaweed ribbons (£29.50). Marinated for five days, the cod unfolds in delicate flakes and awakens the taste buds with delicious umami flavours. You’d be forgiven for thinking things couldn’t get any better and yet larger dishes are equally sublime. Oriental mushrooms and mild ginko nuts are delicately folded within silky green tea soba noodles (£15). A large round earthenware dish of suckling pork belly and eel (£24) arrives shimmering in a luscious fish shock. The richness of the meltingly-soft pork and flavoursome eel counterpoint the young baby carrots and peppery daikon, drizzled with a few precious drops of Japanese jade oil. Wagyu beef (£32), tender and velvety, arrives on a barge-like plate adorned with ruby red beetroot, wild herbs and a garland of edible flowers. As well as these incredible dishes, aqua kyoto is also the place for sushi. Dive into a platter of fresh and delicate scallop (£8), marbled fatty-tuna (£11) or a salmon roll smothered with creamy rich, lobster bisque sauce (£18). Dessert is essential and reasonably priced. Juicy poached nashi pear, (a curious Asian fruit combining the crispness of an apple with the speckled skin and flavour of a pear), sits proudly alongside a scoop of soya milk ice cream and toasted chestnut crumble (£7.50); drizzle everything with warm, caramelised pear syrup served in an oriental stone jug. ‘Forest floor’ (£8), a gorgeous dessert of mint panna cotta buried beneath bitter-chocolate curl branches, earthy biscuit crumbs and the occasional berry, dazzles with every texture and flavour you could ask for. With food this impeccable clamouring for your attention, the drinks menu at aqua kyoto can feel like a place to retreat – a moment to sit back and ponder over your last fascinating mouthful. However, with a wide-ranging cocktail, wine, sake and spirit list, drinks are also deserving of praise. Open with a glass of refreshing and light, Whispering Angel Rose (£11/125ml glass) or a corker of a Riesling (the 'Kung Fu girl'); with dry notes overpowering its background sweetness this wine makes the perfect apéritif. Some serious sake is available too, setting you back anything from £35 to £183 a bottle; the mid-range daiginjo from Nishinomiya, has enough bite to cut through the richer dishes, retaining a mellow flavour that allows the food to sing. Sweet wines are also worth the extra splurge to accompany dessert, or relax with whole rosebud or delicate silver needle white tea. If you’re looking for a meal to remember, head to aqua kyoto. With an exhilarating combination of style, glamour and mouth-watering food, dining out doesn’t get much better than this. 7 destinations curated by Andrew M.